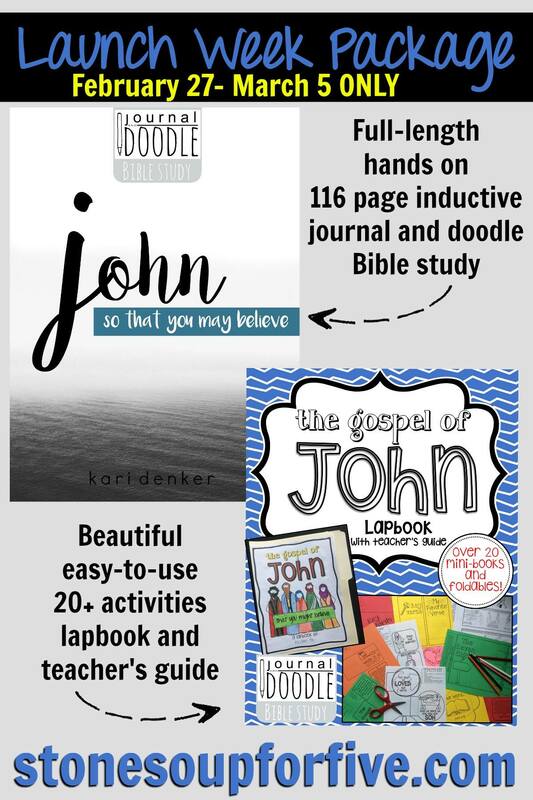 Bible art journaling is wildly popular right now with groups, classes, and Instagram feeds devoted to showcasing beautiful creations. But what if you don’t feel creative? What if you don’t want to cover up the word of God? Is the journaling bible made for artists only? I’ve never been afraid to make notes in my bible. When I first began reading the bible I would highlight verses that seemed important to remember, or passages that were particularly meaningful to me, but I wasn’t really taught how to study the bible. Throughout this post I’m going to link you to many of the books and supplies I find useful. Some of these links are affiliate links, if you make a purchase through these links I receive a small commission at no additional cost to you. Feel free to read my full disclosure policy here. Allow me to clarify: I had been through many bible studies… but I was not truly taught how to study the word of God and dig deeply for His revelation of truth through the Holy Spirit, directly to me. A few years after we had started attending an independent bible church I replaced my old worn NIV Study Bible with a big, brand new, NASB Inductive Study Bible. I was overwhelmed with the blank spaces. I’d read along in it and browsed through the introduction that gave clues on how to use it, but I didn’t make a mark in it. Maybe I was afraid to do it ‘wrong’, I’m just not sure. Most of the time it sat on a shelf and I reverted to my older study and devotional bibles. I wanted clearer instruction on how to study the Word and go further than highlighting bible verses. I received a copy of Doorpost’s Busy Mamas study of Colossians 3 in my swag bag at the Titus 2:1 conference. When I set aside the time to begin that study, I found it was just the pace and depth that I was longing for. In truly manageable bites for my season of life I learned a daily habit of digging deep into the word and using appropriate resources to draw out the truths I should be applying to my life. Learning to study the bible for myself freed me from the limitations of fill-in-the-blank, video-based bible studies. After going through Colossians I wanted to find more instruction along that vein, studies that equipped readers to rely on the Holy Spirit to open up the Word more than another human’s interpretation. 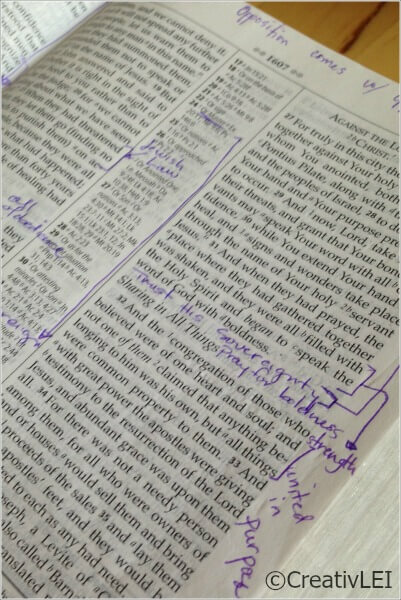 Once I started making inductive study marks in my bible and jotting my notes in the margins I quickly needed more room! Amidst our discussions of what we were learning through our individual studies and the note-making habits we were creating, we came across the Journaling Bible from Crossway Books. Wide margins and the smooth, cream pages many of us loved in Moleskine journals! As soon as I had saved up enough gift cards from Swagbucks, I ordered mine. Deciding on my purpose for using a journaling bible. I am an artist. I’ve been formally trained in studio arts and calligraphy. I’ve illuminated verses before and I have a deep appreciation for that art. However, art was not my goal for my journaling bible. The #journalingbible feed on Instagram is full of inspirational pieces, but I find myself distracted by the art and missing the seamless Word of God. For me, the focus needs to be the unpacking of scriptural truth, not my artistic ability. I do allow myself to get creative in my journaling bible. After all, our God is a masterful Creator and all of creation displays wondrous color and detail. I use markers to jot down points that I pull from scripture as I study. I create titles that help me focus on revealed truth. My hope is that some day my children will want my bibles and will enjoy looking through to read how God spoke to me through His word, and seeing how I applied the difficult verses. I do not cover up passages with art because I need to see the verses in context. When we pull verses out of context we can too easily miss the greater picture God is giving us with His complete word, or assume promises that are not ours. You do not have to be an artist to create a legacy bible. Instead of working hard on the artwork, I look for ways to commit to memory and understand what I am reading by paraphrasing when appropriate and finding timeless truths in ancient words. When reading the Old Testament I find it incredibly helpful to write out family trees. It helps me make sense of the genealogy passages! In my next post I’ll share more about my journaling bible study supplies. What holds you back for bible journaling? Are you familiar with the St. John’s Bible? I got to see it at a museum in my city. 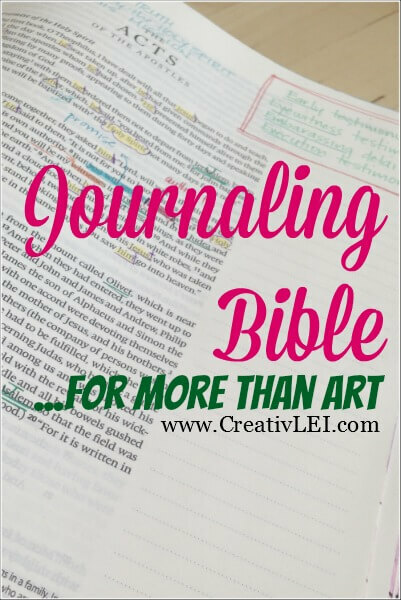 It is AMAZING – talk about bible journaling! I’m joking here as it truly is a work of love and art. Even how the artists fixed errors is fascinating. If you ever get the opportunity to experience it, you should go! Yes! Thank you for this post! I’ve been staring at the art covered Journal Bibles all over Pinterest feeling a sort of sadness that many of them had painted all over the words of the Bible. Thank you for giving inspiration that isn’t necessarily art-based! I’ve wanted to have one of these, but I was not very keen on actually covering up the words…You are the first I’ve seen on Pinterest who uses the journal Bible for your notes and reflections. Lindi, thank you for your encouragement! I definitely agree with you. I am not at all interested in covering the text with my art. 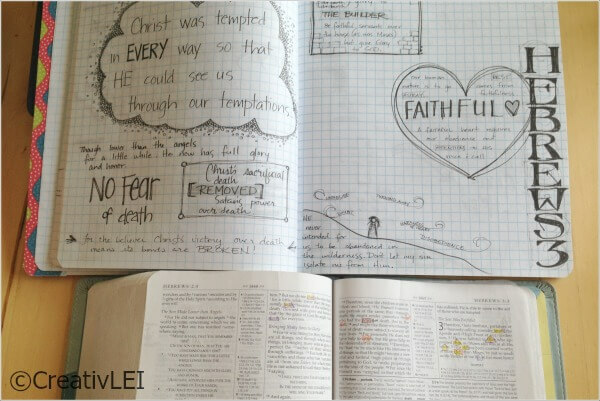 I do keep a separate journal for more study notes and doodles, but again with the focus on the study of the word. I am glad that art journaling is bringing more people to the bible, but for me the focus is study and application. May you be blessed in your pursuit of the Word. 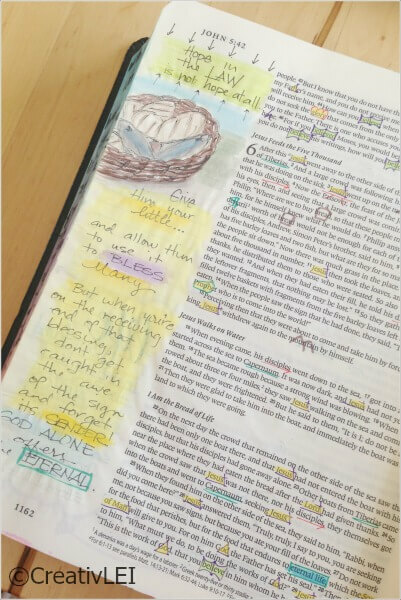 I LOVE the Bible Journal Idea…but I agree that it is sad when they are painting certain pages and covering up the scriptures, in my opinion that’s going too far. 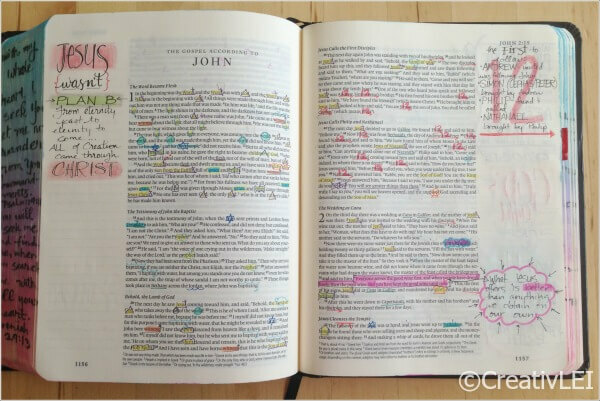 I’ve seen some that are just on the side panels though (which were designed to have notes/doodles) but some very good points 🙂 and yes as with all scripture, you never want to miss the whole picture by taking verses out of context – this happens too often I think. Elise, thank you for being understanding of my perspective. I think how we use our bibles is certainly a personal piece of our walk. 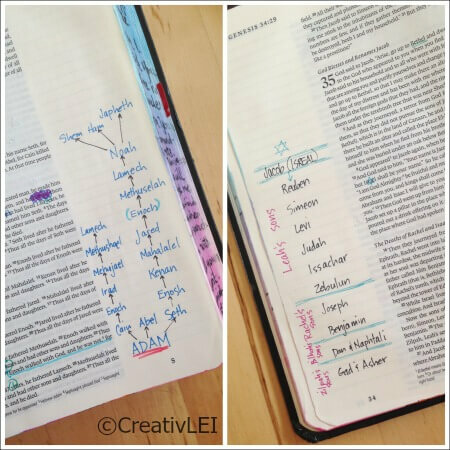 I am glad to share this method of using a journaling bible. I love using it as an opportunity to make notes about how the Spirit reveals truths of the scripture. I love this! I love studying inductively and incorporating some creativity without going overboard. Do you use the precepts Camden resources for your keyword markings? Thank you, I do use some of the Precepts symbols, but not their studies.